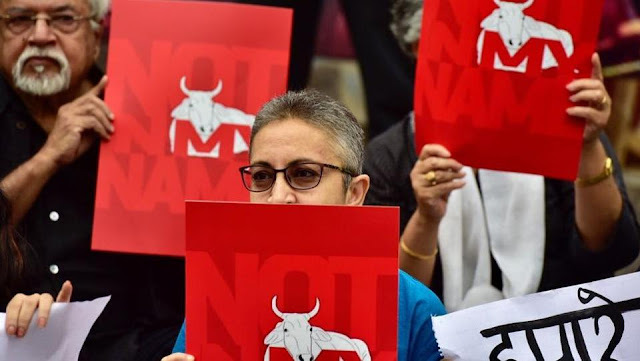 The #NotInMyName protest is a demonstration scheduled in Delhi and several other cities across the country on June 28 (Wednesday) by citizens against incidents of the lynching of Muslims and Dalits. The latest case to hit the headlines was the killing of 15-year-old Junaid Khan who was stabbed to death in Ballabhgarh, Haryana by a mob that mocked his skull cap and called him a beef eater after an argument over train seats escalated. Two of his brothers were injured in the incident. The protest is being helmed by Gurgaon-based filmmaker Saba Dewan who gave out the rallying cry. Although it was originally planned to be held just at Jantar Mantar in the heart of New Delhi, the idea has swept up a great deal of response online enough to be replicated across several cities. Some of these protest points are Dakhinapan premises in Kolkata, Civil Lines in Allahabad, Sector 17 in Chandigarh, Gandhi Nagar in Jaipur, Kargil Chowk in Patna, Tank Bund in Hyderabad, Bangalore Town Hall in Bengaluru, Promenade on the Carter Road in Mumbai, Gandhi Park in GPO in Lucknow, High Court Junction in Kochi and near the Secretariat in Thiruvananthapuram. The protests are scheduled to be held in London, Toronto, and Boston on June 29. In a Facebook post, Dewan called out for the outpouring of public conscience. “Shouldn’t there be protests against the lynchings especially after the murder yesterday in Delhi NCR by a mob of a 16-year-old Muslim boy? If not now then when? Why wait for political formations to organize a demonstration? Why can’t all of us as citizens repulsed by the violence get together in protest at the earliest next week at Jantar Mantar under the banner – Not in my Name,” she wrote in the post. Event organizers said they sought to question the pattern of the attacks on the minorities in the country and the silence of the government over the killings and cases of the lynching of Muslims and Dalits. Participants have been asked to bring banners saying ‘Not in my name’.